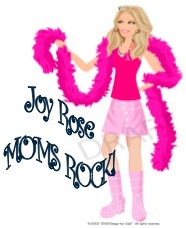 Mama Expo ~ MAMAPALOOZA Rocks The World! The premier international organization for Women in the Arts…who are raising children as well! Mama Expo ~ MAMAPALOOZA Rocks The World! The premier international organization for Women in the Arts…who are raising children as well! WHAT: Presenting Multiple Platforms for women, mothers and families to gather, including Mamapalooza Stages, Academic & Arts Conference, Evening Performances, Concerts FREE Family Festivals. Movement. In partnership with Motherhood Foundation, non-profit M.O.M. (Museum Of Motherhood) & New York Parks Department with performances, informational sessions, advocacy, activism and education happen across the world with performances by thousands. Organized by NOW-NYC’s Susan B Anthony award-winning, Joy Rose, MediaMom™ & MAMAPALOOZA Founder, Lynn Kuechle, MotherMonolgues.org & Team Mama. FAMILY EVENTS: Sunday, May 22nd New York City (City of New York Parks & Recreation) Summer on the Hudson @ Riverside Park South presents the 8th Annual Mamapalooza Outdoor Extravaganza. Pre-event Walkathon at 11AM, free. Noon to 5pm: featuring Tot Rock with renowned Mom Bands, Swingset Mamas, Anna Banana Band, Parent’s With Angst, Bilingual Birdies, Moey’s Music Party, Jane Getter, and more, including vendors & crafts, food, sampling, drinks, giveaways and family fare. Riverside Park South – Pier I @ 68th Street and the Hudson River. Bring your good vibes and your pocketbook to shop! ADDITIONAL EVENTS: Friday, May 20th – MOMEDY™ Comedy; Soter-Lee Blackbox Theater 236 West 78th 2nd fl. 8PM, l Saturday, May 21st – Family Bands & Singer/Songwriter Showcase; Arlene’s Grocery 95 Stanton St. 2-6PM, hosted by *REW l Saturday, May 21st – Hot Mama Burlesque; The Delancy. 168 Delancy St 7:30PM, hosted Raven Snook l Monday, May 23rd – MOM FUN-raiser; Bar East 1733 1st Ave@90th St 7-10PM, hosted by Carol Lester l Tuesday May 24th – She’s History w/Amy Simon and Fear & Desire with Alana Ruben Free; The Drilling Company 236 W. 78th; Wine & Cheese 6 PM, Performances 7-9:30. SUBWAY: 1,2,3,A,C,E to 34th St. walk to 30th St. 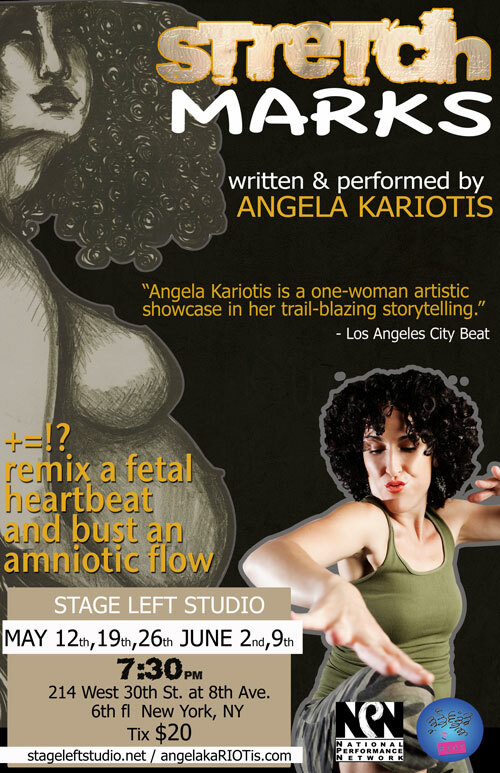 Stretch Marks is a one-woman show about infinite possibilities and ultimately choosing one. It’s about having a baby, being born, what we are born into, the circumstances of our birth, and the legacies we inherit. Forget about the meaning of life, what does it mean to be alive? A dynamic performance that is serious and seriously funny. Run time is 65 minutes. Stretch Marks is a National Performance Network Creation Fund Project.